Learn Mode - The game starts out in a learning mode to help you get the feel for the gyro. 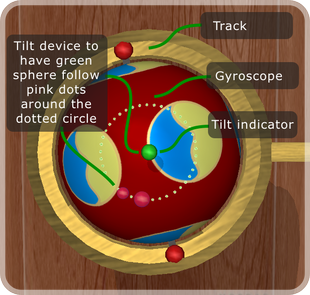 Start by tilting your device up and down and watching the green sphere at the top of the gyroscope. You only need to tilt the device until the sphere touches the dotted circle. Try tilting the device in different directions and see how far it needs to be tilted to get the sphere to the dotted circle. Note the sphere will only get to the circle momentarily then it will go back to the center. If you tilt the device too slowly, the sphere will never get to the circle. Once you have a feel for how fast and far to tilt the device to get to the circle. Try continuously tilting the phone so the green sphere follows the pink dots. The closer you get to the pink dots the faster the gyro spins. If you go too fast and pass the pink dots, the gyro will slow down again. See how fast you can go. Normally the gyro will change directions depending on the direction you tilt the device. Following the red axle end precesses the gyro counterclockwise. Following the black axle end precesses the gyro clockwise. In learning mode, the gyro will only go counterclockwise to make it easier to learn. Removes the training circle. Starts the gyro at a high enough rpm that it is fairly easy to get it speeding up. You can swipe in any direction to give a little extra speed. The gyro speed goes down to zero. You need to swipe or use the turbo start to get up to a starting speed. You have the option of unlocking the gyro so it can tilt while spinning making it even more challenging to maintain speed. Starts the gyro at zero rpm. Removes the tilt indicator. Only operates unlocked and tilting. Good luck! Press the camera button and see what happens!